Haste and Battle cry are a potent combo. Haste is always good for surprising an opponent who thought he knew how much you could attack him for next turn, but battle cry means your foe just found out he was also wrong about which creatures he could safely block without losing the blocker, and which creatures he could afford not to block. And of course, the Hero's third ability means your opponent was also wrong about which of his creature were even capable of blocking. Wall of Omens and those Myr tokens will be of no help now. I can definitely see a Red and possibly White Battle Cry aggro deck arising with the Hero at the top of the mana curve. This much extra damage, and the sudden limitation on which creatures can block, will make for a very potent alpha strike. And the best part is, all this happens every time the Hero attacks, so you can keep the pressure on turn after turn, unlike most Overrun effects that come in sorcery form. Normally, we'd think of abilities like these as being good against other creature decks, letting you win combat or alpha strike. Nowadays, with high-power low-cost white creatures and fourth-turn Titans running around, this may not be where Hero of Oxid Ridge shines. I'd be trying him out against the omnipresent control decks - haste lets him come out after Day of Judgment and do some real damage, and he also allows an entire swarm to get past Wall of Omens and Wall of Frost. I can't remember a red creature I was more eager to put into a red burn deck since Stigma Lasher. My only question is, what sort of animal is he riding? Welcome back readers today's card of the day is Hero of Oxide Ridge a powerful Battle Cry card from Mirrodin Besieged. For Four mana we get a 4/2 Haste creature with Battle Cry and the ability to turn your army into a huge threat. The second ability makes it so opponents cannot block with creatures with power one or less, besides being a obscure combo with Arrogant Bloodlord this can stop token decks from defending allowing you to alpha strike as you please. The fact it prevents small creatures from blocking, has haste, and Battle cry makes Hero of Oxide Ridge a powerful aggressive red card. In standard this card could see play along goblins as well as the token generating power of Kuldortha Rebirth, its a highly aggressive red card that will see play to combat token strategies. In extended and eternal this card could put a dent in tokens and provide a powerful accessory to aggressive red decks particularly goblins. In casual and multiplayer often times defense is the best offense even without attacking with this card the potential swing back if an opponent attack you is scary, it takes care of goblins, elves, saprolings and a plethora of other token strategies. In limited its a fine aggressive body with Battle Cry although the second ability may not always come in handy. Overall a powerful and aggressive red card to supplement the other powerful aggressive red cards available to players. 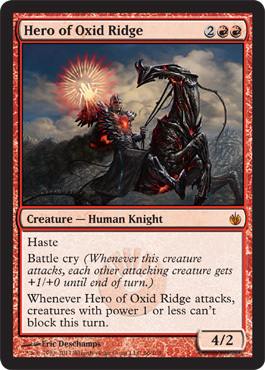 Today's card of the day is Hero of Oxid Ridge which is a four mana 4/2 with Haste and the new Battle Cry mechanic. The Human and Knight types don't currently add a great deal in Red and two on defense doesn't interact overly well with the last effect, so it isn't as impressive as it may first seem. If your opponent is stopping your attacks with small creatures, in particular ones that can be replenished through effects, this can be a very useful card to have. Outside of that scenario it is a bit costly for the lack of Trample, doesn't make an ideal topdeck despite the Haste outside of a stalemate, and Red generally has better options. lowers the power of creatures becomes a bit more useful in combination with the effect, so they can help determine whether building a deck around it is viable. Today’s Card of the Day is Hero of Oxid Ridge from Mirrodin Besieged. What all of you out there may not know is that Red is my piece of Magic’s color pie. I was severly disappointed by red’s performance in Scars of Mirrodin, but am relieved to see that red explodes back on the scene, led by this guy. Hero of Oxid Ridge is a 4/3 for two red and two generic. He has haste, and has Battle Cry, whenever he attacks, other attacking creatures get +1/+0. But his last ability is what truly makes him shine. His last ability is that when he attacks, creatures with power one or less cannot block. Now while that ability may not seem that great, it really is, or at least, has the potential to be tremendous. Thinking in standard, you easily could run a massive combo that could be equally devastating. Run a Red, white, and blue deck (kinda corny I know) and have this guy, with Victory’s Herald, and Gravitational Shift. Now, attack, and sit back and see the havoc caused by your Battle Cry. In Vintage formats, he gets even better. For example, just imagine this guy in combination with Godhead of Awe. I know I am excited to see how that would work. Especially since the Battle Cry would pump them since it is the layering rule. And in the meantime, all of your opponents creatures are helpless. And with Eldrazi spawn floating around as both sources of mana, and blockers, he makes them useless for the latter. All in all, one of the better red cards I have seen in awhile. I hope that there will be more like this guy coming out in the next few sets. Be sure to get to your local prerelease this weekend, and represent your side, after all, it is this weekend that leads to the determination of which side shall win this war.